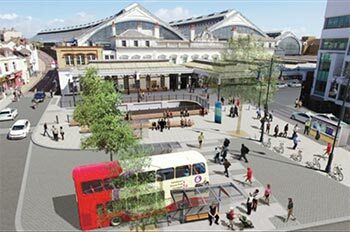 The Brighton Station Gateway scheme aimed to improve the area around Brighton Station to create a more fitting welcome to the city for people arriving by rail. High quality UK-sourced paving has been laid throughout and footways widened. The pedestrian crossings at the top of Queens Road and at Upper Gloucester Road, which were previously crowded pinch points, have been upgraded and widened. At the crossings, the road has been raised to footway level to ensure that vehicle speeds have been slowed and the crossings are more accessible for those in wheelchairs or with buggies. The amount of seating in the area has been increased significantly with benches installed in the forecourt area, along Queens Road and surrounding the new tree on Upper Gloucester Road. The one-way arrangement introduced on Surrey Street and Queens Road during construction of the Ibis Hotel was retained. Signals at the taxi rank exit were removed to allow taxis to flow out of the taxi rank freely. There was previously little greenery in the area. The scheme has introduced trees and shrubs along Queens Road, Surrey Street, Upper Gloucester Road and on the bus stop forecourt area. The bus stop area has been remodelled to provide accessible, step-free access to buses. Bus shelters have been upgraded throughout and a widened footway and shelter outside the Evening Star pub has been introduced. A contraflow cycle lane and toucan crossing on Queens Road have been introduced to improve accessibility for cyclists and more cycle parking installed throughout the area. The taxi rank has remained in its original position.